I am a little tardy with this one, but there was a ton of news coming out of Rare's camp over the last week, as they continue to promote Sea of Thieves and its ongoing content updates. 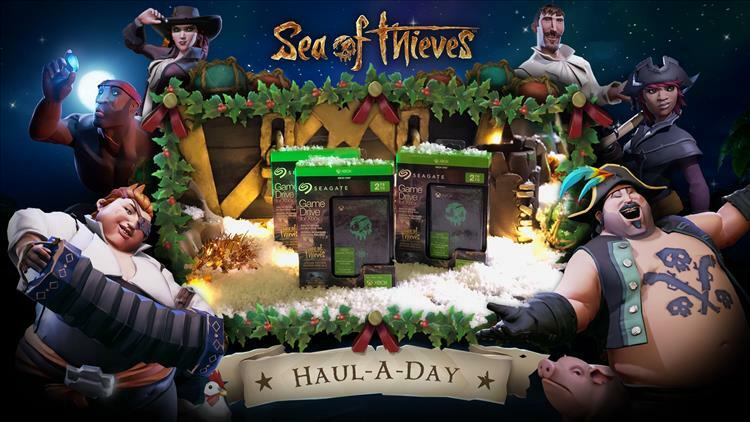 The first item is that during the month of December from the 1st to the 24th, there will be a Haul-A-Day sweepstakes going on where you can enter to win daily prizes, including 3 Sea of Thieves Edition Seagate 2TB Game Drives (Dec 1st) and 5 copies of the Sea Of Thieves Comic Book Collection (Dec 2nd and 3rd). You can find the contest daily on the Sea of Thieves twitter feed and the official rules on the official site. The other new content was two videos posted last week, including the weekly developer update with Executive Producer Joe Neate and then a weekly streaming highlights. Joe spends the video covering the Shrouded Spoils update and going over the thought process behind the content update. The Sea of Thieves Weekly Streaming highlights, featuring the Shrouded Spoils update.